Sano Babu Sunuwar has led many adventures across Nepal and beyond. He has 32 river first descents on Himalayan fed rivers to his name. Babu was the first person to successfully fly across Nepal by tandem paragliding (832km aerial distance). He is most well-known for flying from Mt. Everest (ultimately descending and then kayaking to the sea) earning National Geographic Adventure of the Year 2012. Babu was the only successful pilot to fly from the top of Africa, Kilimanjaro in 2013 at one of the biggest paragliding expeditions in the world (Wings of Kilimanjaro). 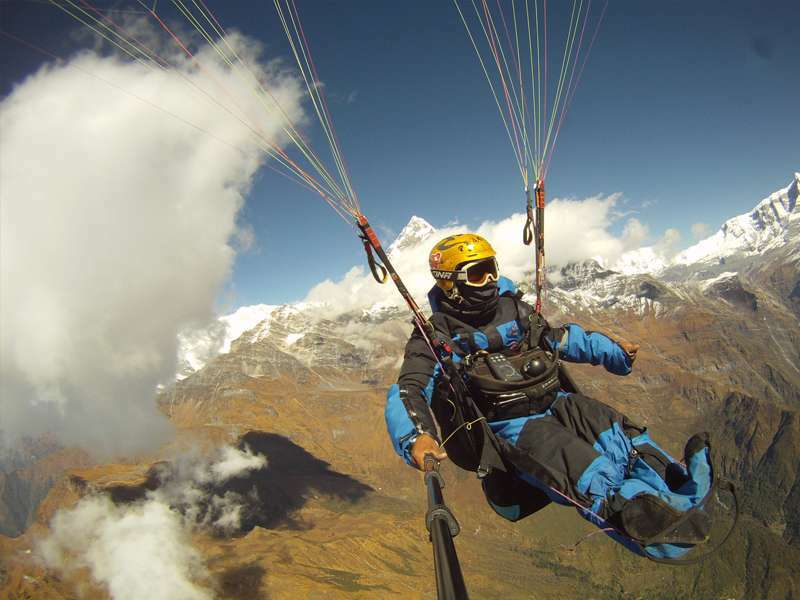 He was the first paragliding pilot from the Himalaya to participate in the Red Bull X-Alps 2013, the world’s largest extreme adventure race among many other exciting activities and adventures in Nepal and beyond. I am Sano Babu from Nepal and a lover of adventures. Babu Adventure is here to assist on your own Himalayan adventure. If you have an urge to explore the magnificence of Nepal on land, water or sailing through the air, maybe all three in one trip, then we are ready to join forces with you. We are a family owned and operated company and blessed to have been born in natural paradise that we want to share with visitors. Babu Adventure welcomes first time adventurers to all skill levels and extremes. We look forward to being right there with you on the epic dream journey of a lifetime. Originally, I am from a small village in the rural hills of Nepal. My homeland area is near the famous Sun Koshi (Gold River). As a boy, I often admired the kayakers and rafters floating by and having fun. I was inspired to do it, too. Eventually, I traveled to Pokhara and realized my boyhood dream there, learning to kayak and raft. I have run rivers all over Nepal, India and beyond. Eventually, I had the good fortune of learning to paraglide. I became a tandem pilot and expedition leader, tour organizer and sky guide under the instruction of David Arrufat and Herv?Cerutti. My adventure history resume includes climbing Mount Everest and tandem paragliding off the summit, and kayaking to the Bay of Bengal, Summit to Sea. The unforgettable journey earned my partner Lakpa Sherpa and me National Geographic Adventurers of the Year, 2012. I regard the universe as our university and my favorite personal saying is, ‘Why not coconut?’…and that means…Push the limits in order to test your skills! Come join us, let’s have an adventure in Nepal’s magnificent natural treasures and push some of our own limits. I like adventure so much that I built my own adventure resort and school and am eager to welcome you there. We offer safe and exciting courses and trips from paragliding to rafting and kayaking, mountain biking, canyoning, trekking, climbing, flying in the peaks and much more. I can assure you that the whole team of Babu Adventure has undergone rigorous safety programs and training. We maintain the highest safety standards in the business. Babu Adventure offers everything under the sun. Join us as we reveal eight out of the world’s ten highest peaks, staggering scenery, fascinating culture and heritage of the people, former palaces and architecture, unique arts and crafts, World Heritage Sites, wildlife sanctuaries and more of Nepal’s many highlights! The whole team at Babu Adventure aims to make you feel like you are at home away from home during your travels with us. On behalf of my family and friends at Babu Adventure, we look forward to meeting you in the Himalaya!